Many and many performances and discussions about the growing Soundpainting phenomena lead me a necessary reflection on the similarities and distinctions to be made between conducting and soundpainting. On one hand many people ask me : « How is it possible to direct a group of improvisors or an ensemble with no score ? » There are musiciens when leaving the and jazz and improvised conduction concerts that ask for more space for freedom of expression. Finally, the debate could be resumes as such how does the individual find his own sense of freedom of expression within a collective group. And subsidiary question : from what number or size of the ensemble do we need to call an orchestral leader playing the role of external ear making decisions for the group? As a preamble to this article, lets us define the respective roles of the conductor and the soundpainter. The Conductor as with the choir director must bring to and guarantee the public of a faithful rendition of the score in question. His means rest on an analysis and rehearsal of the inherent structures of the work to be performed. Considering the soundpainter, his rehearsals will be more concerned with the possibilities of game play emerging from this sign language for the performing arts. He allows himself at the moment of the performance an open space with freedom to change or choose varying strategies of composition. So in one case we have the precision and true reproduction of the musical text in collaboration with the ensemble. In the other case we have a sonic ceremony full of surprises and risk, allowing room to invite « chance » to the party. Nevertheless there are examples of twentieth century compositions where we can witness a convergence between chosen directions and chance results. The works of Boulez (Eclats) and Earle Brown (Available Forms) come to mind as both composers use notated sequences that can be reordered by the chef at the moment of execution. We can speak of open forms (I recommend Umberto Eco, «Opera Aperta ) that will give birth to a kind of open conduction. The human body is naturally expressive but more so in soundpainting since the arms hands and eyes become a virtual score drawn in front of the ensemble. Thanks to a gesture « Shapeline », the soundpainter offers himself momentarily as a dancing show man with the ensemble reacting as in a free interpretation of a silent movie. It often occurs that some soundpainters will choose to use a score with short sequences or Palettes which are determined in advance and rehearsed by the group. A rare but evocative example was Walter Thompson’s project Soundpainting Haydn where he took many sequences of the Cello concerto in C major. Upon listening, there was an explosive encounter between two musical ways of thinking. Almost as a child exploring a toy just broken, the soundpainter explores the elements of the musical construction and proceeds in an interplay of construction deconstruction reassembling the parts to form a new sonic object.. This coming and going between construction and de-construction has become one of the challenges for today’s creative musicians.Concerning the question of sound, it is relevant to both ensemble directors to shape the sound of the group to keep an equilibrium to ensure the clarity of the individual parts and to keep a coherent formal plan of the work. Philosophically speaking, we should consider the divergent goals as well : the direction of the written score is a pre-determined space with predictable end point. Soundpainting when approached with an open mind invites all to a space of discovery whereby the soundpainter seeks to extract the richness of invention from his ensemble. In this new framework, the question of finishing the work is replaced by the question how to prolong the interplay of the sonic adventure. Somewhat similar to phenomenologist, the soundpainter will question his experience with a critical consciousness adjusting in real-time the objects of his auditive perception. The comprehension of this sign language invites the spontaneous expression of the imagination of the performers, while demanding triggered actions that require a compositional modeling in real-time. Taking an analogy from the visual arts, the soundpainter works « al fresco » constantly modeling the sonic materials that are presented, emerging in the instant. The analysis time for the soundpainter is in the moment and equivalent to a television operator making choices between three cameras for the live broadcast of a sporting event. By contrast, the analysis time for a classical conductor is infinite, since is interpretation of a work may undergo many changes over a period of years. Cognitively speaking, both conductor and soundpainter are called to extreme attention to small details with enormous quantities of information to process.I would add a slight plus on the soundpainter side : the latter is obliged to bring forth a form from the potentialities of his ensemble. He is therefore simultaneously conductor and composer and must keep eye and ear on the structural equilibrium of materials used as well as having good judgement when considering the proportions of the different sections of a work. Even in the absence of a score and signing a creative orchestra making individual choices, the conductor is entitled to call himself the composer of this specific event. My rich encounters with Walter Thompson between 2007 et 2017 have shown me the complexity of the cognitif control of the soundpainter. This is especially clear when performers make mistakes or the is a technical malfunctioning (lights off ! stands falling etc.) How do adapt to an apparent chaos keeping one‘s calm is achieved by resorting to the language. The richness of this language allows us to find a way out of a crucial on-stage problem. Despite all appearances of great liberty in Soundpainting, the notion of improvisation (one sign out of 1500) should be replaced the concept of real-time composition. Creativity recreation inventiveness giving shape and breathing life to the traditional or virtuel score (graphique , gestural etc…) are the foremost common goals shared by both classical conductor and soundpainter. To answer the very first thoughts of this article, we need group of open minded artists willing to look at sign language carefully to understand the invitation to simultaneously explore sound and form. Concerning the minimum number of performers that would need an external ear, that answer is not scientific, but depends equally on the complexity and familiarity of the language. Ten performers playing Bach without a chef for the tenth time is feasible (the harpsichordist giving some nods is still useful) but it is often not possible with Berio or Boulez where moving time signatures make coherent rhythmic precision quite delicate. Again, where the conductor is primarily giving clear down beats and entrance cues in contemporary scores, the soundpainter is always opening playing spaces inviting a soloist or group to develop the musical process on collective free will. Acting on the intuition of the instant while always thriving on the richness of the risks, this sums up the soundpainters’ job. How does one become a soundpainter ? Therefore to become a soundpainter we must work on our body language and to move clearly as in a speech devoid of hesitation, stuttering or mumbling. We start by signing in front of a mirror to control the image of oneself projected to his group; then the apprentice must get up regularly in front of a group of friends students and ultimately professionnels that may include other disciplines such as theater dance visual arts. The first steps are to build confidence between sound painter and performers giving all a clear vision of what is about to happen and where the phrase is going. We indicate a simple gesture long tone high register pianissimo then a go gesture ; we listen to the resultant chord/texture and modify if necessary the pitch the intensity or even keep thing as they are and calling this moment Memory 1. We now have a reference point to come back to as a distant recall of thematic composition. Bartok claimed that any chord/aggragat if repeated often enough could be considered a tonic! Directing a live opera would be the most complete form of cognitive control via Soundpainintg. In my own experience directing a multi-media performance (Cavern 3D) I was able to direct a chamber group with 9 voice choir singer actor live electronics and video artist all responding to Soundpainntg. With the video projection I could « cut in » create zooms and with a live camera I could direct the focus angle zoom transpose what was filmed in the moment (myself) onto the screen. We can also draw up palettes of traditional or graphic scores to rehearse form in one’s head and to find ways of connecting gestures that are esthetically pleasant to read and that of course give interesting results. I have personally chosen to build a graphic system Erolgraphs putting the basic Soundpainting gestures into a time frame that disciplines the body into a rhythmic way of signing. Tringles squares and circles containing graphic pictograms help the construction of new phrases and also allows improvisors to think about quick strategy changes within the dynamic interplay of improvisation. I can highly recommend the practice of the martial arts and basic dance technique when preparing the mental and physical preparation in the apprenticeship of Soundpainting. Both sides of the body should be of equal expressivity. This is where the questions of freedom of expression may be answered. In my mind, genuine freedom is born from hard work clarity of though solid technique a curious mind open to all music styles an esthetic spirit that makes connections between all the facets of our tradition and the changing technology of the present day. Then with a refreshed attitude one starts over even looking the classic repertoire with new eyes and ears. We can look at the Art function as a never ending questioning of our fragile relation to the immaterial world of esthetic exchange and interaction. Caverne 3D opéra multi-media N.A.S.A. Between June and July 2016 I had the pleasure of collaborating wiht Researcher Shlomo Dunbov of UCSD (San Diego, who was invited guest at the Studio SCRIME in Bordeaux. built around the algorythyms Factor Oracle and Audo Oracle. Py-Oracle is the first program to use Audio Oracle a graphic structure built starting with elements taken from a sound source. We were able to produce three moderate length real-time composition using muscial tape mixes from my improvisations on Indian Bansuri Flute tenor saxophone and Basset Horn. The magic of the system is its’ cpacity to analyze to segment and to propose a formal itinerary (from many available) while interacting with a live performer (in this case myself). The next step would be to conduct a small ensemble record this then interact with the new cut-up form proposed by Py-Oracle. Etienne Rolin compositeur, soundpainter, improvisateur pédagogue est né à Berkeley, Californie en 1952. Suite à des études en philosphie et en musique à San Francisco, il poursuit son perfectionnement à Paris auprès des maîtres Nadia Boulanger, O.Messiaen, I.Xenakis profitant des stages avec F.Donatoni, G.Ligeti, W.Lutoslawski. Il possède un catalogue de au-dela mille opus allant du solo à l’opéra en passant des ensembles jazz. Il est auteur de plusieurs livres concernant le rapport composition-improvisation (Emerging Ear) aux éditions Tempéraments dont il est co-fondateur. Actuellement il enseigne l’analyse et l’improvisation au CRR de Bordeaux au Pôle Supérieure et à l’Université de Bordeaux et donne des concerts de soundpainitng (composition en temps réel) avec l’Ensemble NASA la musique improvisée au cor de basset et de la musique Hindustani à la flûte Bansuri. Il prépare un nouvel cahier d’aphorismes pour les saxophones en collaboration avec Claude Delangle pour les éditions Lemoine. 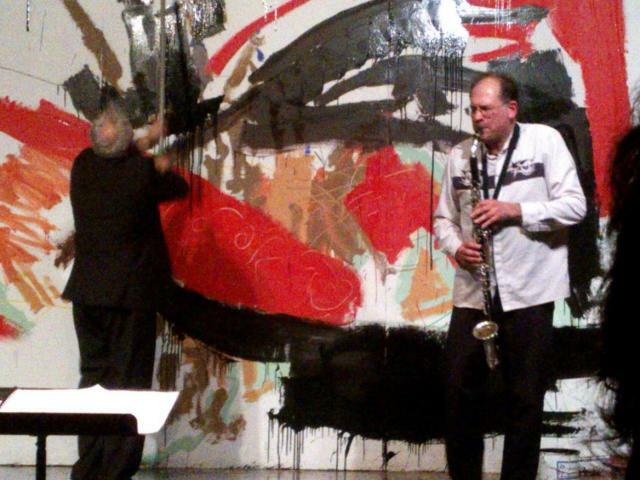 Il prépare conférences et performances pour le Tarapaca Sax Fest en Santiago de Chili pour l’été 2016.
composer, soundpainter, improvisor music teacher was born in Berkeley, Californie in 1952. Following studies in Music and Philosophy in San Francisco, he continued advanced studies in Paris with masters Nadia Boulanger, O.Messiaen, I.Xenakis attending workshops with F.Donatoni, G.Ligeti, W.Lutoslawski. Over the last ten years he was worked closely with Soundpainting inventor Walter Thompson. His catalogue of works surpasses 1000 opus from solos and chamber music to opera (caverne 3D) including jazz ensembles. He has been commissioned by Ensemble Intercontemporain, Ars Nova 2E2MHe is the author of many books on the relation between composition and improvisation (Emerging Ear) Editions Tempéraments which he co-founded. Recent collaborations include research work with Shlomo Dubnov from UCSD on real -time computing and improvisation, and duo improvisations with Gyorgy Kurtag Jr. Mid August 2016 travel to Chile for the Tarapaca Sax Fest in Santiago. He will conduct master classes and performances in Soundpainting. je livre ici la préface qui est suivie de douze chapitres. L’oreille émergeante, titre de ce fascicule sur la perception sonore, pourrait intriguer plus d’un lecteur amené à penser au concept du troisième œil développé en premier lieu dans la mystique hindouiste et bouddhiste. Rappelons-nous aussi que c’est dans la glande pinéale, organe sis entre les deux yeux chez certains reptiles, que Descartes situait le siège de l’âme chez l’être humain (un troisième œil?). Ici, nous ne proposerons ni une voie mystique, ni quelque opération de chirurgie esthétique, mais plutôt une philosophie de l’écoute et de la perception active dans le domaine artistique. Voilà plusieurs années que j’ai la chance de vivre des expériences enrichissantes en musique collective en tant qu’interprète ou comme chef d’orchestre. Ces expériences, qui peuvent conduire à la pratique interdisciplinaire, m’apportent un peu de lumière et me renseignent sur la nature du fonctionnement auditif en temps réel. Dans la vie courante, de nombreuses expressions se réfèrent à l’oreille : l’information est entrée par une oreille et sortie par l’autre ; je sais cela par ouï-dire ; quelle belle « perf » c’était inouï ! Aussi, je me pose des questions sur quantité d’expériences vécues dans notre vie d’artiste et dans la vie de tous les jours. Comment trions-nous, oùstockons-nous toutes ces informations qui nous submergent? Que faisons-nous, de manière créative, avec ces données collectées? Comment l’être humain, grâce à cette créativité, peut-il déployer ses ailes naturelles pour voler à la rencontre de son imaginaire? Les auteurs italiens concluent que les liens établis entre musique et science pourraient amener l’homme au bonheur. D’autres scientifiques me diront que cette troisième oreille n’est rien d’autre que l’hémisphère droit du cerveau où loge notre imaginaire et qui se manifeste à chacun lorsque nous rêvons. Les philosophes classiques reconnaîtront la voie intérieure socratique. D’autres encore situera la troisième oreille chez l’auditeur succédant l’oreille du compositeur et celle de l’interprète selon Jean-Yves Bras). Néanmoins, je revendique le caractère poétique et un peu fantastique de la troisième oreille. Concernant les deux hémisphères du cerveau humain, j’avancerais, comme d’autres, l’idée qu’il faudrait créer une passerelle entre eux. Où se situe la troisième oreille émergeante? Elle se logerait entre rêve et raisonnement, sans être prisonnière des folies del’une ou des froideurs de l’autre. Qu’est-ce qui permet d’éviter le piège d’un cerveau dualiste? Les lecteurs de Bachelard diraient qu’il s’agit de l’intuition de l’instant, à quoi j’ajouterai une activité créatrice prolongeant la perception en situation vécue. À la différence de l’activité spécifique des deux hémisphères du cerveau, la troisième oreille agit au moment-même de l’expérience. Ce vécu est intégré quand il est assimilé corporellement, émotivement et psychiquement. À mon sens, elle nous amène vers le partage, car le réflexe d’une pleine écoute est de rebondir en dialogue dynamique avec d’autres personnes. Il n’y a qu’un pas pour voir comment cette façon de vivre en perception-action peut déborder le cadre artistique pour s’appliquer dans d’autres domaines d’interactions sociales. Ainsi, ce fascicule s’adresse à toute personne souhaitant approfondir son écoute ou du moins s’interroger sur les capacités de notre organe auditif. La référence à la troisième oreille nous servira à donner du sens aux sensations, ouvrant ainsi la voie du silence sur un chemin philosophique dans l’art de l’écoute. February 3 : Hommage à Pierre Boulez. March 20 :Hommage à Olivier Messiaen. May 15 : NASA invites trio Questions de Tempéraments. le 21 février Marseille à la Cité Radieuse Souffle du Bambou première partie Etienne Rolin Bansuri solodeuxième partie Etienne Rolin cor de basset en duo avec Philippe Festou guitare électrique. This is a new word coined by many artists over the last few years. via the Soundpainting language has opened many new artistic ventures for me . This bog should help users to sift through many posts on the internet concerning my work. has been a domain visited by emminent composers from classical and jazz rock traditions. To site but just a few : BERIO, BOULEZ, KAGEL, STOCKHAUSEN, ZAPPA , ZORN, W.THOMPSON. My work with Soundpainting has offered myself a tool to be able to develop multi-disciplinary projects over the years. The path keeps unfolding to take me to a form of Cyberpainting using computers to pick signed gestures and to be able to integrate an ensemble of musicians for real-time music events. The university of Bordeaux is pushing me forward in this direction. 18 performers including video and electronics choir a short libretto all set into motion and controlled though Soundpainting. There is a tremendous physical implication that is mirrored by the mental aural concentration necessary to keep the formal flow going. Other recent work has led me to collaborate with Shomo Dubnov on his Py-ORacle computing progrma for live analysis segmentation and frorm mapping for rela-time composition and interacion with improvising artists.